Australia 408 (Mitchell Starc 99, Steven Smith 92, Ed Cowan 86, Ishant Sharma 3-72) and 3-75 (Phillip Hughes 53*, Bhuvneshwar Kumar 3-25) trail India 499 (Shikhar Dhawan 187, Murali Vijay 153, Virat Kohli 67*, Peter Siddle 5-71) by 16 runs. Australia scored 408 in their first innings and was struggling at 3-75 in 21 overs in the second whereas India responded with a mighty score of 499 in the first innings after 132.1 overs. 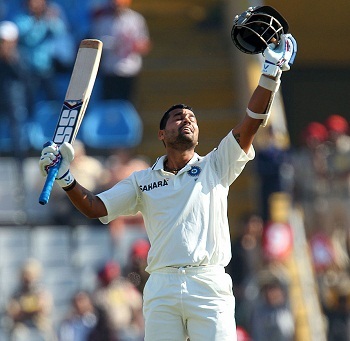 The fourth day of the third Test concluded on Sunday, March 17, 2013, at Punjab Cricket Association Stadium, Mohali, Chandigarh. Earlier, India started the day in a commanding position at 283 in just 58 overs without losing any wicket. Shikhar Dhawan was unbeaten with a mountainous score of 185 in his debut Test whereas Murali Vijay was responding well at his end on 83. The Kangaroos got a much awaited breakthrough on the fifth delivery of the second over when Dhawan was caught by Ed Cowan at silly point off Nathan Lyon for 187 from 174 mere balls with 2 sixes and 33 fours. 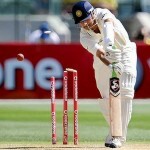 Cheteshwar Pujara was declared leg before wicket off Peter Siddle for just one run as the little master, Sachin Tendulkar joined in with Vijay. Murali Vijay thrashed his third Test century on the third ball of the 66th over whereas Tendulkar got his first four in the 70th over. The run rate slowed down a bit as Vijay survived a huge lbw shout eight overs later and he hit the first six of the day in the 92nd over. The score was enhanced to 384 in 94 overs as Sachin Tendulkar was caught at short leg off Steven Smith for 37 runs on the first ball of the next over. Kohli came in next and the fourth hundred of the innings was posted on board in the 100th over. Mitchell Starc struck twice in the 102nd over as Murali Vijay was held lbw on the first ball for 153 off 317 balls with 3 lofty sixes and 19 fours and MS Dhoni was gone in an identical manner for four three balls later. A couple of wickets fell quickly and the hosts lost their seventh wicket at 431 after 106.5 overs when Bhuvneshwar Kumar got together with Kohli. The batsmen kept on crawling as they hit 4 fours from 123rd to 125th over and Virat Kohli also completed his 6th Test half century. He secured his end with 67 off 129 balls with 1 six and 7 fours as the entire Indian team was bowled out for 499 in 132.1 overs. Peter Siddle bowled excellently on a dead wicket and grabbed five wickets, Mitchell Starc held two whereas Moises Henriques, Nathan Lyon and Steven Smith shared one wicket each. Australia conceded a first innings lead of 91 runs and lost an early wicket when their competent opener, David Warner was caught behind by MS Dhoni off Bhuvneshwar Kumar for just two runs. Phillip Hughes associated next with Ed Cowan who dispatched 3 fours in the third over bowled by Kumar and added another two in the following overs. Cowan looked discoloured and was declared lbw off Kumar for just eight runs and the visitors lost their second wicket at 35 in 7.5 overs. 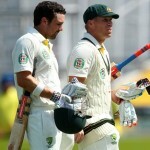 The batsman in form, Steven Smith, walked in next as Hughes hit 1 six and 1 four in the 11th over off Ravindra Jadeja. Smith multiplied the worries of the tourists when his stumps were dislodged by Kumar for five runs as the young fast bowler claimed his third wicket. Phillip Hughes continued with his style, he hit 3 fours in the 15th and 16th over and attained his sixth Test fifty on the second delivery of the 17th over with another four. He remained unbeaten for 53 off 68 balls with 1 six and 9 fours as the night watchman Nathan Lyon was at the other end at four as the Aussies managed 75 runs for the loss of three wickets. Australia is still 16 runs behind the first innings total of India and with just one day left in the game it looks like a drawn match but the doors for victory are still open for the home side.